Please see attached photos. The first 2 are at Ocean Lakes Resort and the last one is at Carolina Ridge. May 18, 2011 was Health Day at Ocean Lakes Resort in Myrtle Beach. Rena Grant and Richard Skovran, Myrtle Beach's newest ambassador along with Richards wife Diane and Rena's son-in-law Neil taped off a section of flooring in the huge Rec Center. The employees lined up for a morning of instruction. The employees took to the game right away. 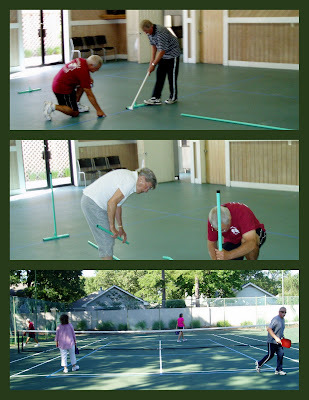 It looks like Ocean Lakes will continue with their plans to have pickleball within their structure. A fun day was had by all. He opened up the invitation to people within his complex to come and learn the game. He invited fellow pickleball players to come and play also. A BBQ picnic was held at the end of the day at Richards place. A fun day was had by all. It looks like the courts at Carolina Ridge will get a permanent change in the way of Pickleball.